With the new demands of the digital age, it is all the more important that your business software allows you to innovate and respond rapidly to customer demands. SAP calls companies with these capabilities ‘intelligent enterprises’. But what does this mean in practice for manufacturers, and how can cloud ERP help you reach this aim? Post 3 in our smart manufacturing series provides the answers. The intelligent enterprise: at first glance, this phrase might appear to be another fancy term for an unattainable or unspecific goal. But when you examine SAP’s vision more closely, it becomes apparent that there are many useful aspects behind it – and many of the aims are achievable today. So where does the term originate? SAP identifies three stages in the recent evolution of the manufacturing industry. This starts with the transactional enterprise of the 1990s, characterized by process automation and lean manufacturing. In the 2000s, the responsive enterprise arrived, bringing integrated supply chain planning and more flexible processes. Now, we are in the era of the intelligent enterprise, where cloud ERP, the Internet of Things, and integration from shop floor to top floor enable the smart factory. A surprising number of manufacturers are still at the transactional stage. However, as customer demands and industry competition grow, this is becoming less and less feasible. Many companies are now realizing that cloud ERP can release them from their current struggles. For example, many manufacturers use on-premise ERP systems that have been heavily customized over years. The systems become cumbersome, and keeping them updated consumes valuable, and limited, IT resources. Moreover, legacy systems often have to be linked to other, possibly third-party solutions – creating multiple versions of the truth. This slows the flow of information to management teams and ultimately hinders a company’s ability to keep up with changes in the market. With cloud ERP, however, automatic quarterly updates not only ensure you have the latest functionality, but also free up your IT team. Your team can then focus on more strategic matters that will add value to your business. What’s more, with a sophisticated cloud ERP system like SAP S/4HANA Cloud, based on the SAP HANA database and a simplified data model, you can run your business with a single source of truth. This optimizes processes on the shop floor, while driving decision making at the top floor. Once you have an advanced cloud ERP system, you can link in additional intelligent technologies for different parts of your business. This not only includes manufacturing and supply chain solutions, but also covers all lines of business from customer experience to HR processes. 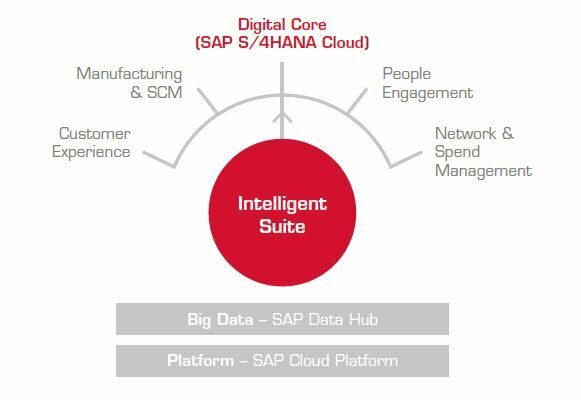 The result is what SAP refers to as the ‘intelligent suite’ (see graphic below). In this way, you can enhance your core ERP system with whichever capabilities your business requires. As all of these solutions run on SAP HANA and follow the same data models, they can be easily connected and then form a truly intelligent enterprise. The ideal setup for an intelligent enterprise. As I mentioned in my last article, SAP is now embedding intelligent technologies into its standard solutions, such as SAP CoPilot, the digital assistant included with SAP S/4HANA Cloud and the connected Line-of-Business solutions. But there are also additional opportunities to take advantage of pervasive technology. SAP Leonardo, for example, gives you access to a range of technical capabilities that allow you to transform your business. By utilizing the Internet of Things and blockchain, you can rethink your business model and deliver your products in entirely new ways. This helps you to stay ahead of the competition and generate new streams of revenue. In my next blog post, I will examine insight-to-action driven processes.